It always amazes me why people think New Yorkers are unfriendly. I would use a lot of words to describe the Big Apple. Words like busy, bustling, thriving, poor, rich, energetic, cutting-edge, artsy, cosmopolitan, strong, imposing, multi-faceted, daunting, culinary, hot and humid topped the list for this trip to the city that never sleeps. However, I have to admit with the exception of a few moments, I slept like an old man propped up in a chair. Out cold. I managed to make it from Newark Liberty International Airport to New York’s Penn Station to the hotel, with the monster suitcase, and didn’t end up in Harlem, Queens or the Bronx. 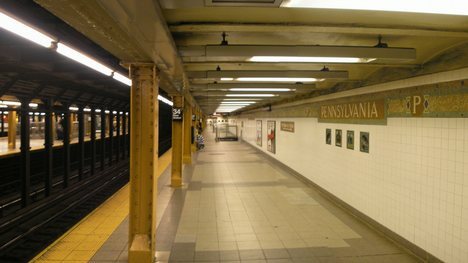 I thought I was doing pretty good as I hadn’t navigated the subway on my own before. There are so many lines and choices… Shoulda taken the F-train instead of the C-train because I would have been closer to the hotel. Lesson learned. However, after a 30 minute wandering around the platforms and tunnels, I came up “close enough” and took a taxi the few blocks to the hotel. Smart move. As at that point, the suitcase was HEAVY and the heat and humidity had me drenched in sweat. I’m sure I was attractive. I got to the hotel…. and showered and even washed out my clothes so they wouldn’t stink up the room or the suitcase. Line dry is a great thing. 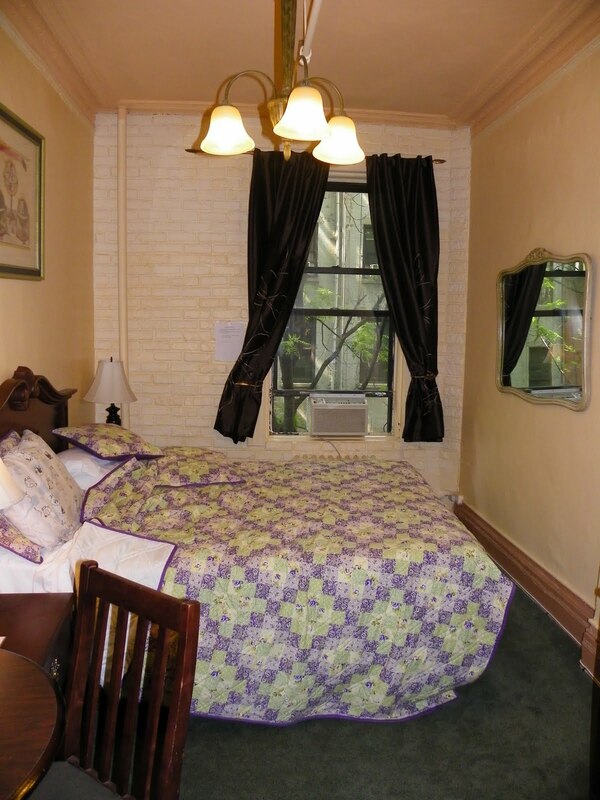 This is the room I stayed in at the “Chelsea Inn.” Trust me when I say there is nothing fancy about this room. This is one of the guest rooms where you have to share a bathroom with another room. In this case, I stayed in room 303 and had to share the loo with the occupants of 304. For the most part, this wasn’t a problem as we both cleaned up after ourselves. However, the downside is if you really have to pee, you can’t really yell at the person to hurry up as you would a family member or close friend. You have to wait it out. Waiting it out definitely isn’t enjoyable. And speaking of the bathrooms. These have obviously been redone as this style and such wasn’t present when the brownstone was built in the 1880’s. However, let me explain an oddity. 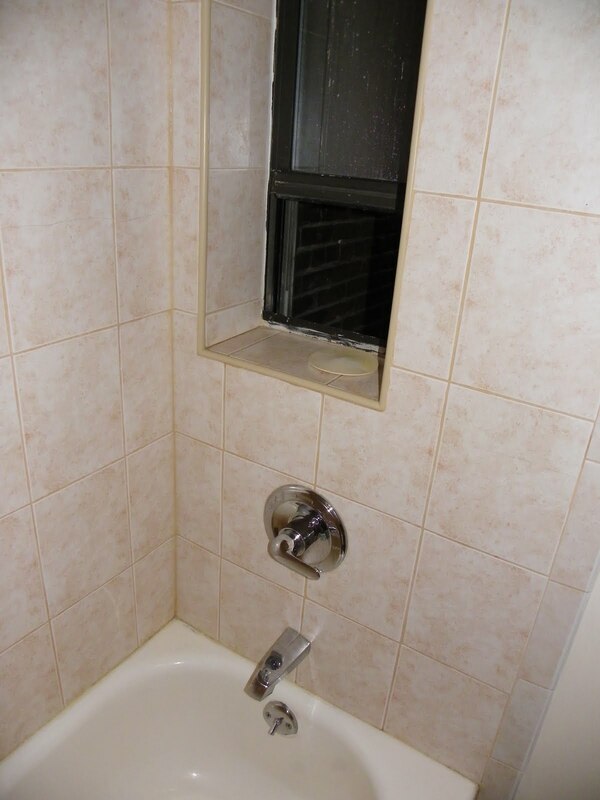 There is a window in the shower that sits above the faucet. This means the shower head actually shoots down on the faucet and getting in the shower takes a little more unique effort. However, this window has an interesting view…. 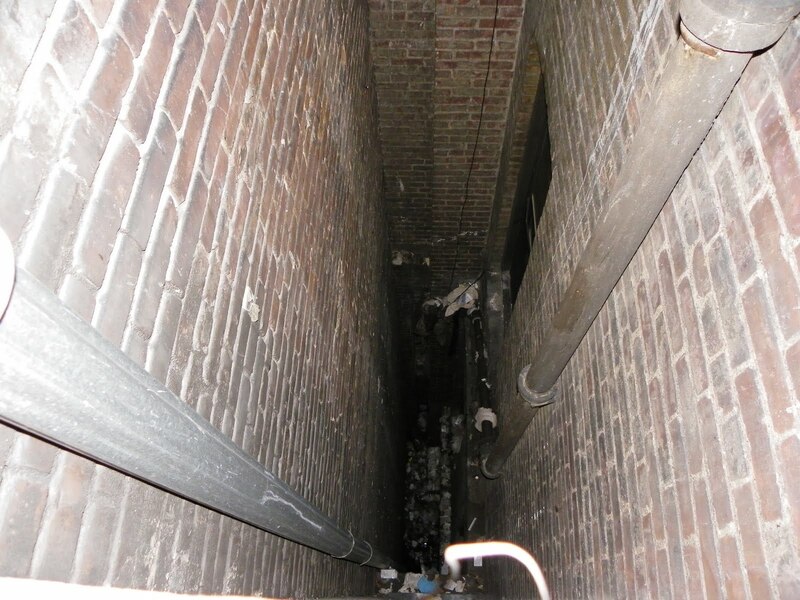 This is the ventilation shaft that runs up the building and all of the bathrooms have windows that face this shaft. No worries about people looking in at you while you are showering because they are staggered. However, I distinctly heard a gentleman singing in German. It actually sounded like Adele’s “Rolling in the Deep.” Who knows? 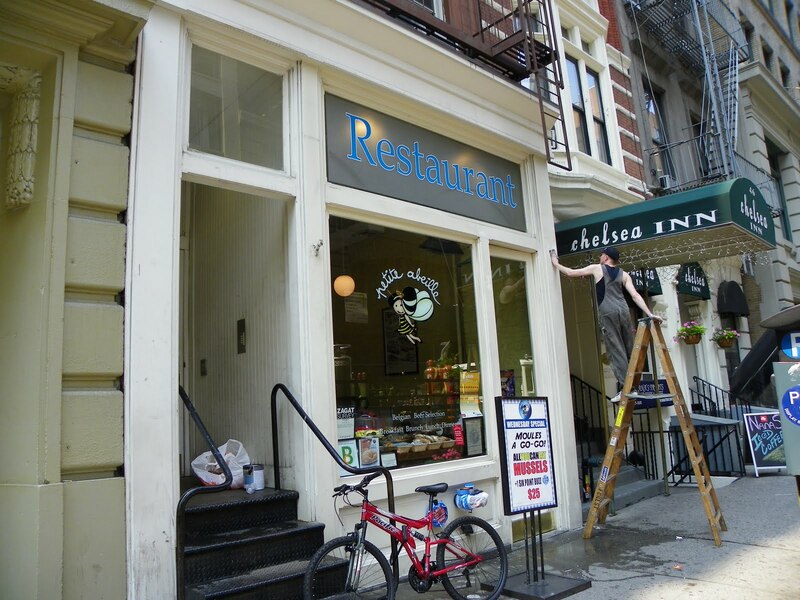 We went out to dinner at “Petite Abeille” which is right next door to the Chelsea Inn where I stayed. 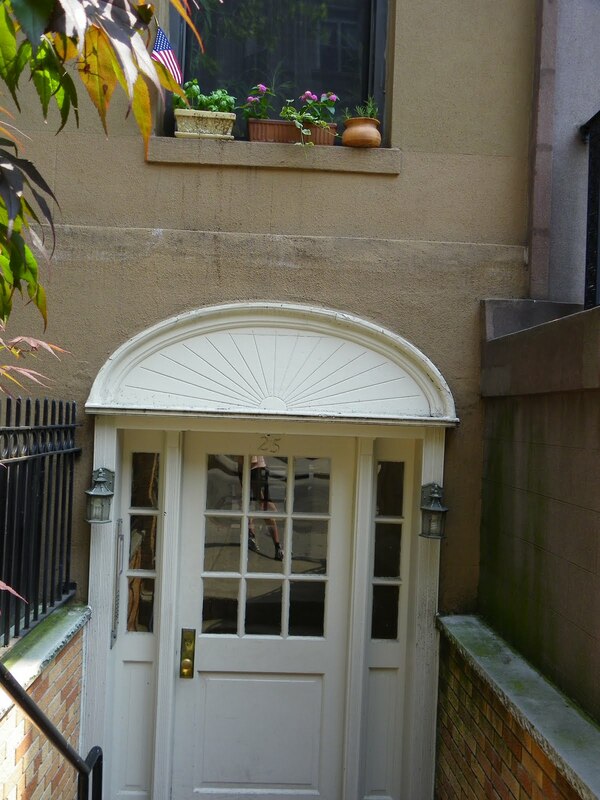 This is pretty close to Christina and John’s apartment. The Belgian food was amazing. I had mussels for an appetizer and then fish and chips for dinner. I have to say New York is THE place for fish and chips (outside of England…) John and Christina had a couple of Belgian beers and some amazing food. I have tried to remember exactly what they had; however, exhaustion was setting in at dinner and that didn’t go too far. Shortly after dinner, I actually went back to the Inn and crashed to gear up for day two. This trip to New York was different from the other trips I have taken in that I can say with the exception of a Broadway show that ROCKED, I didn’t really do any of the touristy things that people do in the city. I actually spent some time wandering around between 10th and 23rd streets between 5th and 6th Avenues. There are some amazing stores and the architecture just can’t be topped. More on that to come….